The islands of the Sangihe archipelago can feel unimaginably remote. They’re spread across a maritime frontier that most Indonesians, let alone outsiders, rarely consider: the liminal space between Indonesia and the Philippines. Many of the islands, in fact, are actually closer to the Philippine island of Mindanao than to the closest Indonesian “mainland,” Sulawesi. The border slicing through the Celebes Sea is noticeably nebulous here: many Sangirese, the native people of these islands, have called Mindanao home for centuries, and Filipino booze is routinely smuggled through the waters in exchange for Indonesian kretek cigarettes brought over by Sangirese fishermen. In an age of reified national borders, it’s easy to forget that these two countries are in many ways cut from the same cloth, Austronesian twins separated by cruel colonial happenstance. While culturally bearing some similarities to the Minahasans of nearby North Sulawesi, the people of Sangihe trace their roots to the North. Sangirese society, they say, was first built by Gumansalangi, a prince from either the Sultanate of Maguindanao or Buayan in Mindanao. Some musical similarities can be found between Sangihe and Mindanao, with kulintang-like gong chimes once played in Sangihe’s Tabukan Kingdom, but this isn’t unique to this corner - similar music is still played much farther south in Sulawesi, too. I came to Sangihe, though, in search of something found only in the in-between: tagonggong. The tagonggong is a large kind of goblet drum, a drum type essentially unheard of in the rest of Indonesia. Its curvaceous form calls to mind far-off drums like the West African djembe or Middle Eastern drums like the darbuka or dombak, and in fact all of these varieties may be one large, extended family. Tracing farther eastward, those Middle Eastern varieties are speculated to be the ancestors of the dabakan, a goblet drum used to accompany the kulintang ensembles of nearby Mindanao. The dabakan is a likely cousin of the Sangirese tagonggong: both can be played with the instrument standing in an upright position, with rhythms beat out by sticks (in Sangihe, this method is often used to accompany the ritual war dance, tari salo.) The tagonggong, though, is more often played with the instrument held horizontally, balanced on the player’s knee, and played with the hands. This technique could be another mark of Middle Eastern influence: not only are goblet drums like the darbuka/dombak played in this way, but so is the rebana, a large frame drum with Middle Eastern roots played in Muslim communities in Sangihe and across Indonesia. Regardless of its provenance, the tagonggong has long been deeply embedded in Sangirese customs. The instrument is a potent tool used in sundeng, a name used to describe both Sangihe’s indigenous belief system and the tradition of sacrificial rituals once performed by shaman-led communities around Sangihe. According to Sangihe-based historian Alffian Walukow, the tagonggong’s rhythms were once joined by instruments like the nearly extinct oli mouth harp in accompanying sundeng rituals in which a young virgin would be sacrificed to appease ancestor and nature spirits, with the tagonggong’s rhythms leading the sacrificed person’s spirit into the spirit world. 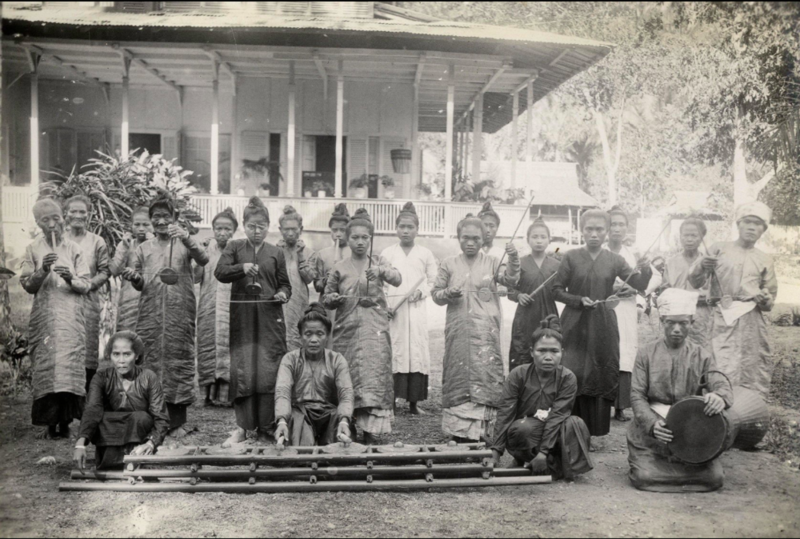 The arrival of the Dutch in the late nineteenth century led to an evolution of this practice, with the sundeng ritual replaced by a tagonggong-led ritual called medaroro in which a pig was sacrificed instead. The Dutch later paved the way for Protestant missionaries who, along with mass conversions, essentially banned the explicit practice of the indigenous animist belief system and its related rituals. Sangirese priestesses of the Tabukan Kingdom pose with oli instrumentation - oli mouth harp, arbabu fiddle, sasaheng bamboo buzzers, and bangs flute. In the foreground is a set of kulintang gongs, and to the right is a tagonggong. in Tabukan, Sangihe Besar, 1927. Courtesy Leiden University Libraries Digital Collections. The power of sambo still remains to this day: musicians that I met in Lelipang on the island of Sangihe Besar said that even recently, a particularly powerful verse had struck down a man in their village not so long ago. Two mĕbawalasĕ sambo opponents had faced off in a ceremony held to celebrate the rice harvest. After one of the musicians was unable to cast back a spell-like sambo, he fell dead in the fields the next day. When asked to give an example of such deadly sambo, musicians balked: it’s too powerful, they explained. In the tagonggong and sambo form I documented in Lelipang, the musicians performed a less deadly sambo variant in which the verses are poetic mantras repeated and passed from singer to singer. tagonggong repertoire has four underlying lagung or rhythms: Bawine, Sasahola, Sonda, and Balang, always in that order. The rhythms of the tagonggong are almost uniformly slow, with sonic space left between sharp slaps of the goatskin for verses to ring out. The playing is, in principle, unison rather than interlocking, but there’s a looseness (one elder critiicized later as sloppiness) in the performance which allows individual tagonggong players to add their own accents. Which lagung are performed depends on the context: the lagungs “Sasahola” and “Sonda,” for instance, are (or once were?) played at weddings. Other occasions (including our recording sesh, it seems!) call for the repertoire to be played almost nonstop. This is the case for Tulude, an annual festival often described as “Sangirese New Year” in which the Sangirese symbolically leave behind the past year and turn towards the new one. It’s a big affair, with local government (and, in the past, royalty of Sangihe’s various kingdoms) gathering with the people to celebrate together. The peak of the festival is the communal eating of kue adat tamo (literally “customary guest cake”), during which the tagonggong is often played to entertain the assembled masses. As the musicians play, women may perform the slow, graceful classical dance called tari gunde; men, meanwhile, take turns dancing on a pair of wooden boards (pepare) which clack rhythmically under their bare feet, a practice called mataronda. If it weren’t for the government-sponsored celebration of Tulude each year, tagonggong and sambo may have already faded into history. As mentioned before, since the Dutch occupied the islands and allowed European missionaries to proselytize starting in the late nineteenth century, traditional practices have taken a massive hit. In an all too familiar story, these Protestant missionaries banned practices related to sundeng and traditional beliefs. The Europeans are long gone, but the attitude towards mystical Sangirese traditions remains, with some evangelical locals rejecting music like tagonggong and sambo as being forbidden relics of a pagan past. Tagonggong didn’t fair much better in the islands’ Muslim communities, which never outright banned the music but replaced it with “Islamic” genres like hadroh. A similar replacement can be seen in Sangihe’s majority Christian communities where the call and response verses of mĕbawalasĕ sambo made way for (and were largely replaced by) the sanitized, Western harmony-filled choirs of masamper. With the indigeneous belief system essentially dead in its explicit form, tagonggong and sambo mostly live on as symbols of a largely forgotten past, hauled out each year for tulude and then forgotten once again. For the older generation of Sangirese who play tagonggong and sing sambo each year, though, the music still shines with irrepressible potency. It takes patience to get to Sangihe Besar, the main island in the Sangihe archipelago and the center of Sangirese culture. If you’ve got the money, you can fly there, but the masses go over sea, a twelve hour journey in a rickety ferry from the North Sulawesi capital of Manado. After years of mostly sticking to the mega-islands of Indonesia like Sumatra and Kalimantan, I tend to forget that this is a fact of life for millions of Indonesians, hours and sometimes days spent languishing in painfully slow ferries as they crawl through the maritime emptiness that makes up so much of the country. After a few days of nonstop travel to get to Manado, my wife Sinta and I decided to treat ourselves, booking a private cabin in the ship’s interior so we wouldn’t have to show up hours early and fight for floor space with the much savvier locals and their roll-up mattresses. The cabin was decent: it was a cramped, somehow frigid space with a few stray cockroaches and a narrow stack of cots, but at least we had some privacy. I’m still a sucker for some mingling, though, so I sat up on the ship’s roof and made some friends. As we set off from Manado’s harbor, an orange sunset faded to muted blue and the land receded into the distance. It would be hours until we reached land again, so I tucked myself away in the cabin and let the waves rock me to sleep. It was barely five in the morning when we finally arrived, Sinta and I stumbling disoriented into a dark, unknown harbor. What felt like the edge of the world was actually Tahuna, the regional capital and the archipelago’s only proper town. Taxi drivers yelled out destinations to the dispersing passengers, and I was lucky to catch a “Tamako, Tamako!” Soon enough we were shooting down the island’s coast, the sky growing just light enough to illuminate a succession of perfect, palm-fringed bays through the roadside greenery. Morning mist was still clinging to the hills as we drove into Lelipang, a village nestled in a protective valley. It was one of the most pristine little villages I’ve ever seen in Indonesia, with a single main road leading up through the sloping valley to lush jungley hills. Humble houses lined the road, each one surrounded by perfectly pruned flowers and fruit trees and green lawns strewn perfectly with boulders as if in a zen garden. Skinny dogs roamed the ribbon of asphalt, strolling past churches and piles of fresh cinnamon ready to dry in the heat of the sun. We soon hooked up with Pak Frits, a guy with eyes as wild as his hair and a warm, relaxed hospitality. A Lelipang native named Makiwine who’d posted a tagonggong video to YouTube had pointed me here, explaining that Frits would put us up and his father’s tagonggong group would play for us. Frits’s house, I was surprised to learn, was also a losmen, a cheap, old-school kind of accommodation often run out of people’s houses before savvier “homestays” became a thing. The village saw a trickle of foreign backpackers each year, essentially all of them European birders, completists in search of Sangihe’s nine endemic bird species, most of them, like the wonderfully named Caerullean Paradise-flycatcher, critically endangered. We were the first to come in search of the island’s equally rare and endangered music, a comparatively easy task. Frits introduced us to the right folks - the village head and Pak Adonis, Makiwine’s dad - and we were soon set to record in two days’ time. We spent the days soaking in the village vibe, taking baths in a crystal clear stream across from the losmen, heading into town to buy vegetables at the market and laze on an empty beach. Soon enough, though, it was tagonggong time. Shots of cap tikus get passed down the line as we record. Folks began to gather on the fringes of the courtyard as the tagonggong echoed through the valley. It was just as I’d seen in Makiwine’s video, voices rising and falling over the sharp clatter of goatskin and the tapdance-like syncopation of bare feet on wood. Without pausing, the cup of cap tikus would be passed from player to player and on to me. Our chests were warm and the music was flowing. Some silk scarves were passed out and a group of women began to dance tari gunde, arms out and fingers slicing slowly through the fading light. Soon it was dark. There were no lights around, and I’d surely gotten enough material, but as the cap tikus flowed, nobody thought to stop. For three hours, the four men played on, voices cracking. I soon realized they were drinking me under the table, and any professional illusions I’d maintained were quickly gone. At some point in the waves of cap tikus, my digital recorder mysteriously glitched, erasing the preceding two hours of music. I inwardly cursed, pressed record again, and took another shot. As the crowd of spectators thinned, I took off my shoes and danced mataronda, my bare feet clacking against the boards as the men laughed. We were all pretty drunk and happy. Eventually, I guess, they ran out of verses to sing, and the music died out. I applauded like a drunken fool, repeating the only word I’d learned in Sangirese: “Mapia, mapia!” Good, Good! I abandoned the professional plans of a more sober me, interviews and transcriptions pushed to the morning. We all walked home together down Lelipang’s lonely road, men peeling off one by one into the dark with tagonggongs over their shoulders. I woke up the next morning with cap tikus on my breath and a smile on my face, tagonggong still ringing in my ears. Terima kasha banyak keypads Bang Makiwine, Pak Frits dan Keluarga. Dan kepada musisinya, Udin, Minong, Adonis, dan Kode, dan penari: Saskar, Niken, Bogale, Cili, dan Ting.